Dynastic politics is not the hallmark of just the Gandhi-Nehru family. It has now become an integral part of Indian polity, cutting across party divides and regional lines. ThePrint brings you 34 most influential dynasties. New Delhi: With the election season well underway, the ruling Bharatiya Janata Party (BJP) has turned to its pet theme to attack the Congress — dynastic politics. The party’s leaders never miss an opportunity to attack Congress president Rahul Gandhi over his lineage, while even reserving contempt for Gandhi’s great grandfather, India’s first prime minister Jawaharlal Nehru. But while the Nehru-Gandhi family dominates the discourse about dynasty, this culture thrives across political parties and regions — from the north to the south, the west to the east. Such is the extent of dynastic politics, that some families have members who not only cut across the political divide but also across state lines. As early as last week, union minister Ram Vilas Paswan remarked that there is a demand from workers of his party — the Lok Janshakti Party — to field his wife or son from the Lok Sabha seat at Hajipur in Bihar. This even as Paswan’s son, Chirag, is already a Lok Sabha MP and brother Ram Chandra Paswan is the MP from Samastipur in Bihar. If Paswan does field his wife Reena, she would be the latest from the clan to join public life. 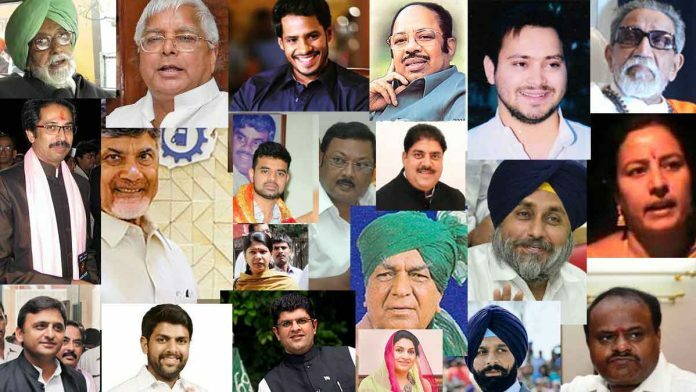 With the tradition now seemingly entrenched in Indian politics, ThePrint takes a look at 34 of these prominent political dynasties across 20 states. (where at least three members of a family have been in active politics). The dynastic politics begins right at the country’s northernmost state of Jammu and Kashmir where two families — the Abdullahs and the Muftis — have dominated public life for decades. The more prominent of the two are the Abdullahs, who have had at least four chief ministers from their ranks, spanning three generations. 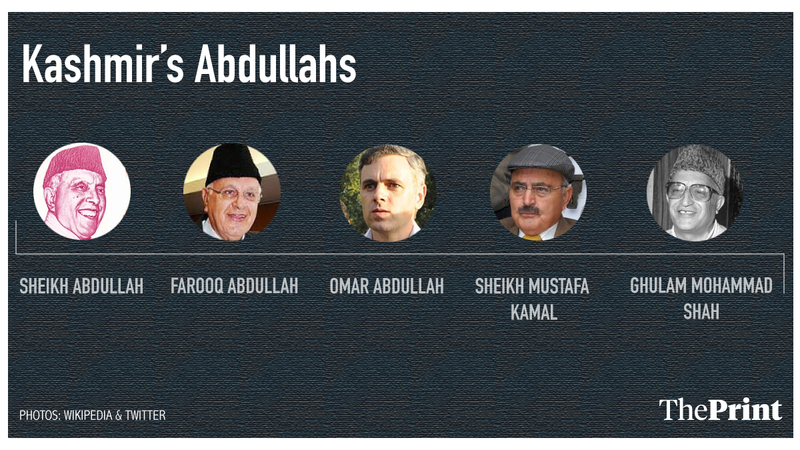 The current National Conference (NC) leader Omar Abdullah has served as the J&K chief minister while his father, Farooq Abdullah, has been at the helm in the state on multiple terms besides being a union minister in the UPA 2 government between 2009 and 2014. Omar’s grandfather is Sheikh Abdullah — popularly referred to as ‘Sher-e-Kashmir’ (Kashmir’s lion) — who founded the NC before going on to serve as the prime minister of Kashmir and later as the chief minister. The family’s ties to the top chair in the state do not end there. Farooq’s brother-in-law — Ghulam Mohammad Shah — served as the chief minister in the 1980s. Apart from this, Sheikh Abdullah’s brother, Sheikh Mustafa Kamal, served as a minister in the state while Sheikh Nazir, Farooq’s cousin, was the NC’s longest-serving secretary-general, having held the post for nearly three decades. He passed away in 2015. The Muftis, meanwhile, have had their patriarch Mufti Mohammad Sayeed, the founder of the Peoples Democratic Party (PDP), and his daughter Mehbooba Mufti serve as the state’s chief minister. Sayeed’s son, Tassaduq Mufti, a cinematographer, is the latest entrant into politics from the Mufti family. Is THEPRINT a news portal or congress mouthpiece?? In almost the states/reigon you mentioned there are political family dynasty from congress but you put the picture of just one congress dynasty which ( Scindias) is a split dynasty. Why are you trying so hard to show that being a dynasty is not congress speciality? Or maybe the pictures of congress leaders were not available on net???? A top place for this news feature at 10:30 on 08/03/2019 in search results when you type ‘India’ on Google thanks to SEO or whatever else. Because there are virtually no other other issues that need such prominence isn’t it? Because the most covetous, subversive, sneaky, under-the-radar-kind-of-murderous national political dynasty ever could use more coverage and subtle campaigning by unfair comparisons to regional dynasties who just want to look after one region they feel they understand and keep it from being plundered from the national political dynasties. And this coverage comes at a time when elections aren’t too far . It doesn’t take a rocket scientist to see which political overlords fill your pockets. And we’re supposed to believe you’re any different from a TOI or Economic times or NDTV. Your narrative started with BJP but only two out of the 34 mentioned by you, truly belong to the dynastic rule i.e. Scindia and Yeddyurappa that too are only in the politics and not running the parties….. Whereas are other dynastic parties running their parties as Private Limited Companies….. That difference you again failed to highlight….. Even the fourth estate has failed this great country in true sense….